Josie is wearing her new Summer dress- she loves the matching cardigan which keeps her warm when the sun goes in. 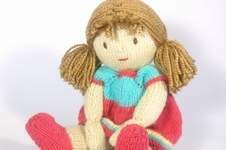 Josie Doll- Josie is knitted with head, body, legs and feet worked as one piece, there is a centre back seam from the crown of her head to the start of her legs. Josie’s legs have a seam on the inner side and her feet have a seam along the middle of the sole. Her arms and hands are knitted as one piece and sewn into place after stuffing. *Recommended yarns- *Doll-Paintbox Yarns Simply DK, Vanilla Cream 107 *Hair-King Cole Big Value Chunky – Sahara *Dolls clothes-Paintbox Yarns Simply DK, or any DK/ Light Worsted weight yarn.